Most people mistakenly believe that the Dodge Invoice Price reflects what the dealer paid for a new vehicle - The true Dealer Cost. It is not! Purchasing a new automobile is something that most people will do several times throughout their life. It can be very helpful if people are more familiar with a new car pricing terms. New car pricing terms can involve one of the most effective ways to negotiate a new automobile price. When negotiating a new cars pricing terms it may make it easier to compare what other buyers within the same market paid for the same vehicle. There are several sources available when seeking information concerning a new cars pricing terms. The MSRP which stands for Manufacturers Suggested Retail Price refers to the price that the automaker publishes for any given make or model automobile. Auto dealers have the option to sell an automobile for a higher amount (above MSRP) or a less amount (below MSRP). It is important for anyone purchasing a new automobile to pay close attention to the “Dealer Invoice Price”. The dealers Invoice Price is normally printed on the invoice sheet that comes directly from the vehicle manufacturer. Dealer Invoice Price can easily be found on the Internet. Many car manufacturers now publish information related to Dealer Invoice Price on line. 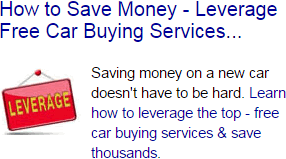 In addition, this information can also be found in great detail in auto pricing guides. This is an extra fee charged to you as a fee occurred to the manufacturer for shipping the vehicle to the dealership. Typically the destination charge is already fixed into the sticker price, but it is always good to look into this and find out if it has been added to the price of the vehicle. Dealer sales incentives are typically offered to the buyer. Dealer sales incentives are basically unadvertised payments that the manufacturer offers a dealer for selling certain make and model cars. The dealer may pass sales incentives directly to the buyer by price modifications or adjustments. AHoldback is a refund that the dealer will receive after the final sale of the vehicle occurs. A Holdback is a way of reimbursing car dealers for financing costs. Financing costs can amount to a great deal of money over a period of time. The word “Rebate” is quite common when referring to the sale of an automobile. A rebate is something that is paid directly to the buyer from the manufacturer. Rebates are supposed to encourage the sale of a vehicle. Market adjustments are quite common within the automobile industry. Market adjustments can amount to thousands of dollars over the set market price. These kinds of adjustments normally occur when a highly anticipated or unique type of automobile is for sale. Market adjustments disappear after a period of time. Base Dodge Invoice Price + the dealer Invoice price of Options + Destination - Holdback = Total Dealer Cost.